Not the actual program but an incredible simulation!!! Our Most Excellent Unplanned Adventure! We dispatched our Southern Correspondent to this year's Animazement, held on Friday, May 24 through and including Sunday, May 26 at the Sheraton Imperial Hotel & Convention Center in Durham, North Carolina. Embarking on Thursday night from the top secret SOS Southern Plantation, our representative was immediately greeted with bumper to bumper road construction on Interstate 40 (the main thoroughfare of North Carolina). After battling traffic the fun began; here is their report. This year's guests at Animazement included the return of Fushigi Yuugi creator Yuu Watase, Di Gi Charat animation director Hiroaki Sakurai, Japanese voice actor Akira Kamiya and what seemed like everybody and their grandmother from Coastal Carolina Studios of Wilmington, North Carolina. 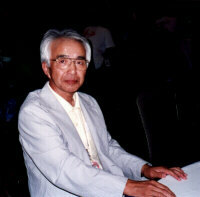 But the real gem was Yasuo Yamaguchi, the "Chief Planner" of Sailormoon for Toei Animation. 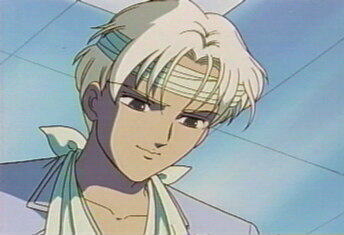 A Chief Planner can mean different duties at different studios but at Toei (and especially in Sailormoon's case), it meant the person who was responsible for overseeing the adaptation of the original manga (comic book) to anime and interfacing with the publisher (Kodansha) and the creator (Naoko Takeuchi). But Mr. Yamaguchi's involvement went much further than that as he is credited with possibly being the key individual who convinced Toei to option the material. With a career in animation spanning close to a half century, Yasuo Yamaguchi began as an assistant in Toei Animation's Education Department. He later moved on to produce such series as "Ge Ge Ge no Kitaro", "Candy-Candy" and "Getta Robo." Mr. Yamaguchi is currently an Adjunct Professor of Animation at Tokai University. There, using his wealth of experience, he helps instruct the next generation of animation professionals. We conducted an interview with the aid of an interpreter, Mr. Yamaguchi spoke in Japanese. How did you get tapped as Chief Planner for Sailormoon? "I had relations with a Japanese editor from Kodansha's Nakayoshi. I've known this person since the days I worked on the series "Candy-Candy" with him. I later thought wouldn't it be nice if we could come up with a project similar to "Candy-Candy." Something that could be exported widely and receive international recognition. And that's where the talking began." 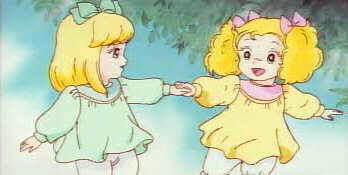 Orphans Candy and Annie, from Candy-Candy. Candy is adopted by a wealthy family who makes her a servant - but somewhere in the world she knows she'll find her bagpipe-toting prince charming and her childhood friend Annie. "When the entire project was moving foreward, I had the editor-in-chief give me a selection of different authors (manga artists) that I could choose from. Most of these at the time were up-and-comers who were making a name for themselves in the manga business." "Out of all the ones I looked over, the one whose storyline stood out the most was Ms. Naoko Takeuchi. So I figured her work would be the best fit for our new project. Furthermore, the whole concept would be to have her re-create the boys "Tosaksu" fighting series (Power Rangers) and tailor it for girls." "Ms. Takeuchi was given a list of requests for writing what we would like to have happen during the narrative parts but we didn't specifically say this and that had to be incorporated. So in many respects, her uniqueness and versatility as an author was not limited to her art style but also to the stories and situations that she created through her manga. So a lot of what you saw that you speak highly of is a reflection of her contribution to the series as well." Even though you are an older and well respected gentlemen in the animation business, how did you handle overseeing a project aimed at younger audiences? "I took it upon myself to make sure this project got off on a good start. So I went through a lot of trouble of assembling the members of the production crew before the series even started. Once the choices were made, I basically stood out of the way for the young producers and young creators to make their efforts fruit and bloom." "In many respects, I stayed in the background making sure that the wheels were oiled. In my opinion as both a participant and perhaps as an older gentlemen to respect the boundaries to which a planner contributes to the project and something beyond that is dependent on what the creators actually carry out." At this initial, informal setting, it didn't seem proper to ask Mr. Yamaguchi some of the more sensitive issues concerning the adaptation of the manga. (In just the first 2 seasons of the series such issues would include making Zoisite in love with Kunzite, Rei in love with Mamoru and the whole [what we call the] Doomtree episodes. There is also the question of Naoko basing the manga on "Go-ranger" vs. Toei's desire to base the anime on "Juu-ranger" [Power Rangers].) We hope to conduct another interview with Yasuo in the future. 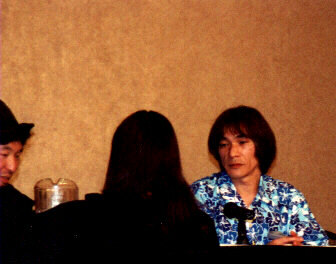 Yuu Watase - Photo taken by Kevin Lillard of "A Fan's View"
Besides being one of the most popular shojo artists currently working in the business, Yuu Watase is probably one of the most outgoing manga artists at anime conventions. She's posed with countless cosplayers and has even been known to attend the occasional fan party or two. At this year's Animazement we even saw her selling "Fushigi Yuugi" merchandise outside the dealers room along with a doujinshi based on her hit serial "Ayashi no Ceres." The following excerpt from the press conference was conducted with the aide of an interpreter for Ms. Watase who spoke only Japanese. We asked, "You've been going to Animazement now for three years, how does knowing you have a loyal fanbase here in the United States help you with creativity in regards to future serials?" "By realizing I have overseas fans, I've since changed my notions for whom I wrote my stories for. In the past, I was only concerned with writing for readers near me. Now that I know I have readers in other parts of Asia and America, I know to whom I can send my message out to." Later we asked, "...If there was anything about us (American anime fans in general) you liked? And to follow it up, how are we different than when you meet Japanese fans?" "There are Japanese fans who are extremely over enthusiastic. I tend to distance myself from those kind of people but I tend to feel the American fans are better at knowing their manners and behaving themselves... I also find American fans to be more open than Japanese ones." 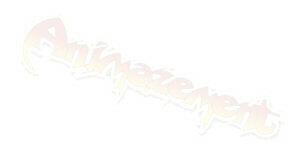 Image of Professor Tomoe from Gallery of Moonlight. One of Animazement's regular Japanese guests Akira Kamiya, (Dr. Tomoe) held a panel where he taught some of the basics in Japanese voice acting. There was an amusing catch however--you had to listen to him sing inbetween lessons. (No one seemed to mind.) Akira also sat in with the folks from Coastal Carolina Studios during a different panel entitled, "Voice Acting 101" to help illustrate the difference between a day in the life of a Japanese voice actor vs. an American one. Most Japanese V/As start out in an improvisational group much like Second City in Chicago or the Groundlings of Los Angeles. Japanese V/As will work on five to seven shows a week. American V/As will read and then record their parts solo. Rarely will they read and record as a group. Japanese V/As will read and then record their parts as a group (so they can hear how one another are acting in a scene). Most of the cosplaying this year was themed around Di Gi Charat since it's animation director, Hiroaki Sakurai, was in attendance (signing everything from Puchiko-plushies to $89 cels). He also took the time to draw Super Deformed Dejiko next to his signature. So how was Animazement this year? Despite a few minor setbacks, the convention ran smoothly (thanks to Brian and Jenny Exelbierd, their hardworking staff and translators Daniel Kanematsu, Takayuki Karayuki & Maki Tereshima). Even members of North Carolina's finest were getting in the spirit of things! 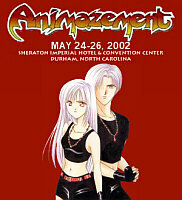 So yes, we will be back and if you've never attended you should give Animazement a try.